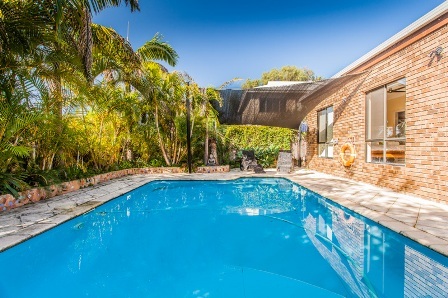 Cottesloe Beach House Stays explores the benefits of choosing Perth short term accommodation compared to that of a Perth hotel. Short term accommodation is perfect for those people who enjoy the comfort and independence of having your own space, with CBHS offering a range of fully furnished self contained properties. Instead of being cramped in a single hotel room guests are able to enjoy the comforts of extra space and individual rooms. After a few days in a hotel, the room tends to look more and more like a junkyard with souvenirs piled next to the bed and electrical devices battling for outlets. With the wide variety of properties that CBHS offers, guests can choose from one bedroom studios apartments to five bedroom houses. Because of the variety in size we can find a property that is just right for you and your requirements! No need to eat your dinner with 50 others. No more searching for a chair by the pool. Enjoy outdoor activities with family and friends, without disturbances or interruptions. Would you find this kitchen in a hotel? This is particularly the case when couples or families travel together. Guests can share the cost for a whole house rather than paying for separate rooms in a hotel. For instance, the Cottesloe Beach Pines Apartment can accommodate up to 4 guests comfortably from $215 per night through low season. Dividing the cost between 4 adults equals $53.75 per night! 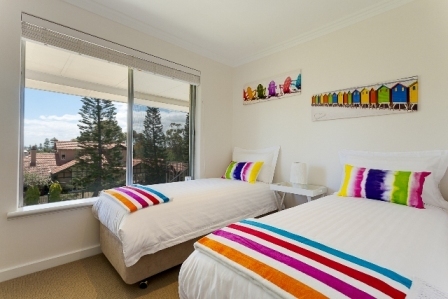 Second Bedroom at Cottesloe Beach Pines Apartment - Beds can be joined together to make a Queen! 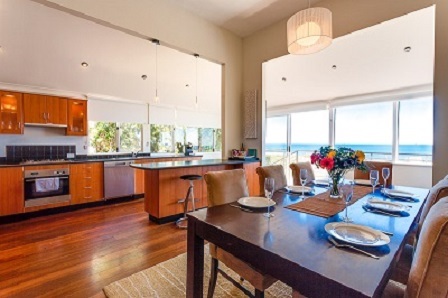 Cottesloe Beach House Stays offer properties that are unique in style and pride ourselves on maintaining excellent cleaning standards.Every property has distinct features which allow guests to experience that home away from home atmosphere. Forget trying to find the correct door number in long corridors of replicated rooms; short term accommodation is an ideal choice for travellers wanting a stay that is distinctive and memorable. Guests can experience the local flavour of the area, with properties situated throughout Cottesloe, Mosman Park, Claremont and Nedlands. 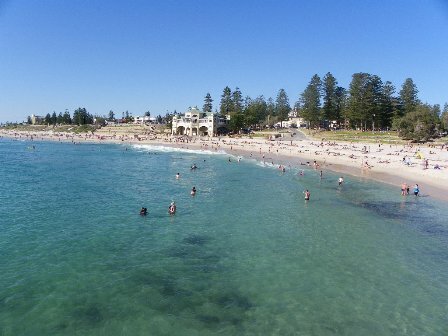 Cottesloe is famous for its beautiful beach, cafes and relaxed atmosphere, with guests able to explore the intricicies and delights of this unique suburb. Booking accommodation needs to be as easy as possible, from the start of the booking process right through to when you check out. Cottesloe Beach House Stays personalised service ensures guests feel at ease with the property whilst respecting the privacy of your stay. Our motto is: “We care, we can do and we want you back again!” This is why we have after hours contact numbers in case of any urgent matters. We also offer meet and greets at many or our properties to go through all of the ins and outs.